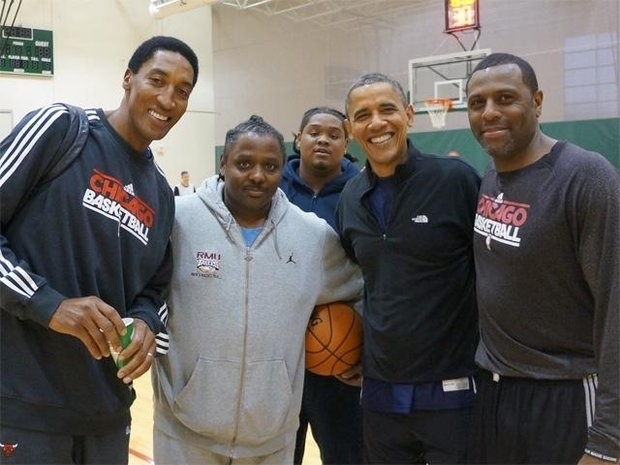 Former Bull Randy Brown(far right) has won NBA titles, playing ball with the President was an equal thrill. President Obama made basketball an Election Day tradition. It was not an ordinary pick-up game. There was a star bigger than any player former Bulls guard Randy Brown had met with on the court. Bigger than his former teammate Michael Jordan. Another former teammate, Scottie Pippen, was there. But the spotlight was on the President. It was a day Brown will remember for the rest of his life. Brown knew President Barack Obama and had played basketball with him before. However, this day was different. It was Election Day. Brown played 12 years in the NBA and from 1995-2000 he was a member of the Chicago Bulls. He was part of three NBA titles with the Bulls. He became aquainted with Obama while playing here when Obama was a Illinois state senator. They played pick-up games at the East Bank Club during those days. The President had the same modus operandi for Election Day in 2008, but the former Bull was in California and not part of the action that day. When Brown and I talked about the 2012 Election Day game, he still seemed astonished by the magnitude of the moment. The President’s close friend and confidante Marty Nesbitt, initiated the contact through another former NBA player and it was all supposed to be done under secrecy. He did have to spill to a few people, mainly his bosses. Brown works for the Bulls as an assistant to General Manager Gar Forman. He told Forman and Bull&apos;s President John Paxson so he could get permission to leave the office. There was one more person he couldn’t keep the secret from, his wife Tamara. They did manage to keep it from their children. After the fact, when they found out that their dad had participated in this game with the President, Brown was “cool” again to his children. As to the actual action, Brown wasn’t figuring it was going to be much of a contest, just a little “hoop” play. It was four-twelve minute quarters, with three referees and fouls and free throws. “It was like a real game,” Brown said. There were at least 20 participants, including staff members, Reggie Love, John Rogers, former Bull Jeff Sanders and Arne Duncan. Nesbitt was the coach for the team that included Brown and Pippen. The President’s team was coached by his brother-in-law and Oregon State coach Craig Robinson. Father time may be catching up to this group, but Brown said it was competitive and the President can still shoot. Maybe the two-and-a-half hour game was an omen. The President’s team pulled out the win. Randy Brown wasn’t a star in the NBA; he was a role player from the West side of Chicago. When I asked him what this pick-up game meant to him in regards to his basketball career, Brown hoped his former Bulls teammates won’t mind his sentiments. Follow Cheryl on Twitter @CRayeStout and Facebook Cheryl Raye Stout #AtTheGame.